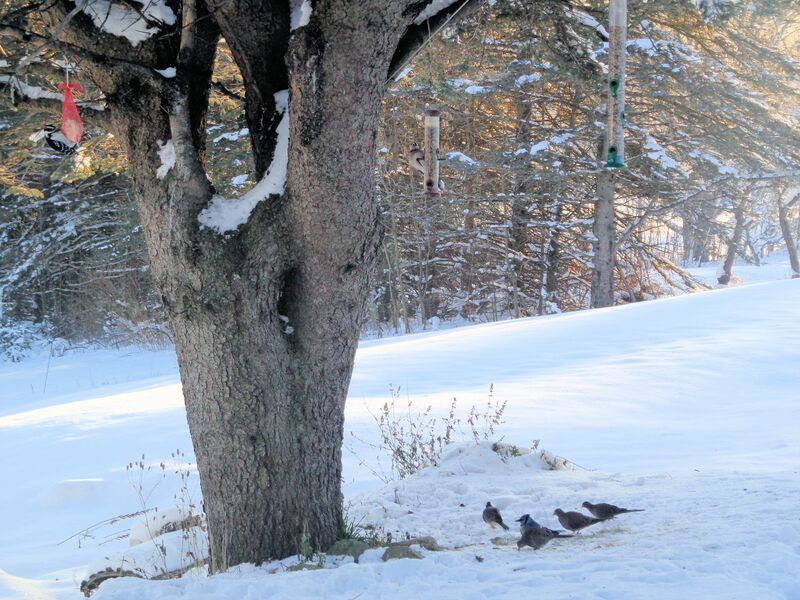 The chilly weather and snow cover have brought hungry birds to the feeders. This year we bought a new 30″ long seed feeder so we wouldn’t have to refill our 12″ one every day. The woodpeckers were particularly insistent on being fed. It took me a few days to dig their suet out of the chest freezer and hang food for them in a mesh bag. I figured there must still be bugs in dead trees out in the woods that they could eat, so I wasn’t in a hurry. 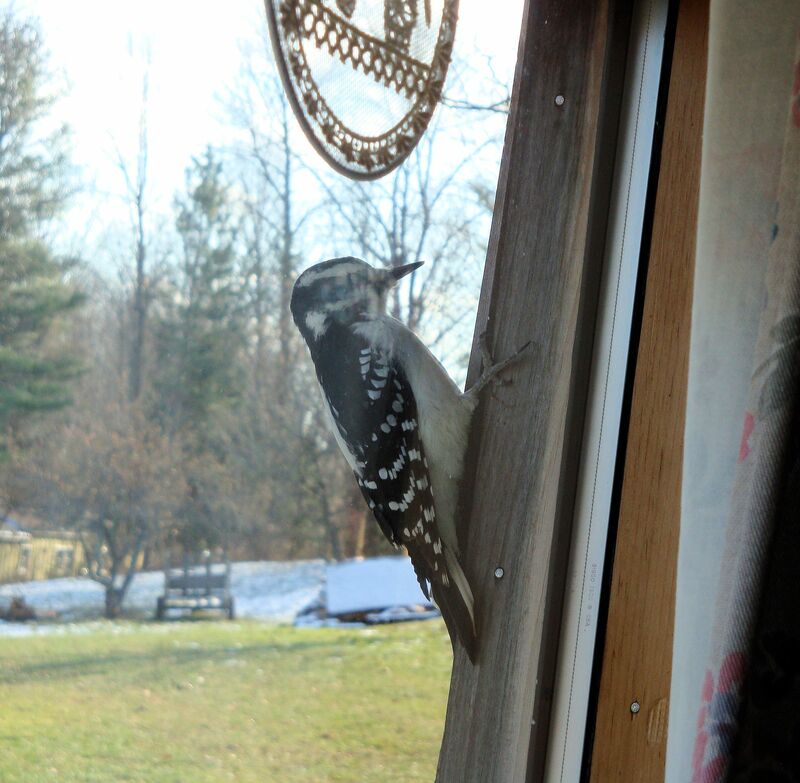 Just to let me know what I slacker I was, several woodpeckers pounded their beaks on the side of the house and a couple flew right up to the window and looked in to see what was taking me so long. It became impossible to ignore these birds. Their hammering on the cedar siding was very annoying. As soon as the suet was hung, the birds were eating. It’s been nearly a week since I put food out and they’ve devoured at least a half pound of suet. I wonder what these birds did to survive before humans started feeding them? Time for an update of the barn building project. I’ve got the structure for the temporary barn framed and mostly sided. There is still part of the outside wall to finish in the rabbit section. I’m going to fill the open top part with a translucent sheet so light can get in. The wall had to be made of metal to keep the horses from chewing on it when they get bored in the winter. Still hoping to find some cheap roofing shingles before winter really sets in, but that may have to wait until spring. So far the blue tarp is working well. The hay storage area is finished except for two doors. 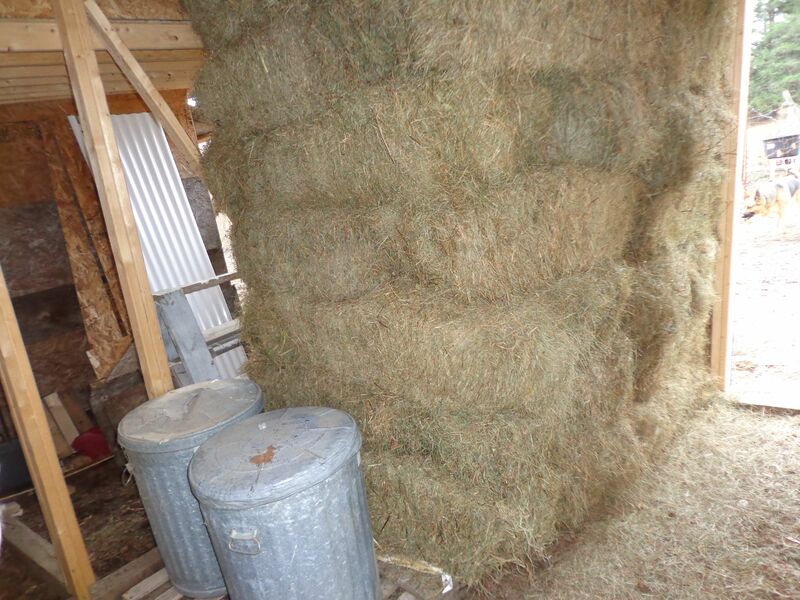 Tim and I filled the storage area with forty bales of hay, enough for forty days. That’s wonderful! Last year I could only store eight bales at a time down in the horse barn. There is enough room for two metal garbage cans to hold bags of grain for the horses and rabbits. That will make winter feeding much easier. No more carrying buckets of grain through the snow every day. There is still plenty of interior work to be done. I have to finish the wall between the hay storage and the rabbit area and run some wiring for lights. 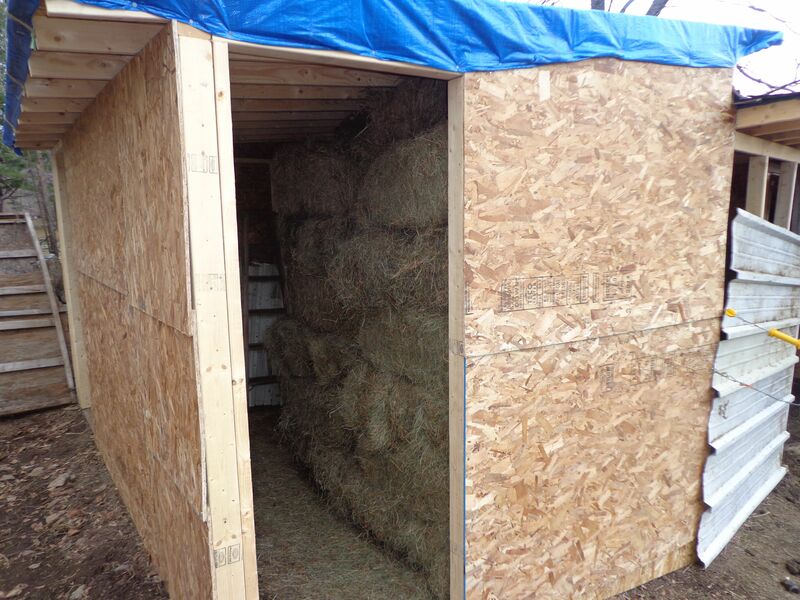 Plus make two doors to keep the hay area snug and weatherproof. I try to do some work on the barn every day that’s possible, along with all the other fall chores like garden clean up and firewood. Never a dull moment on a farm. 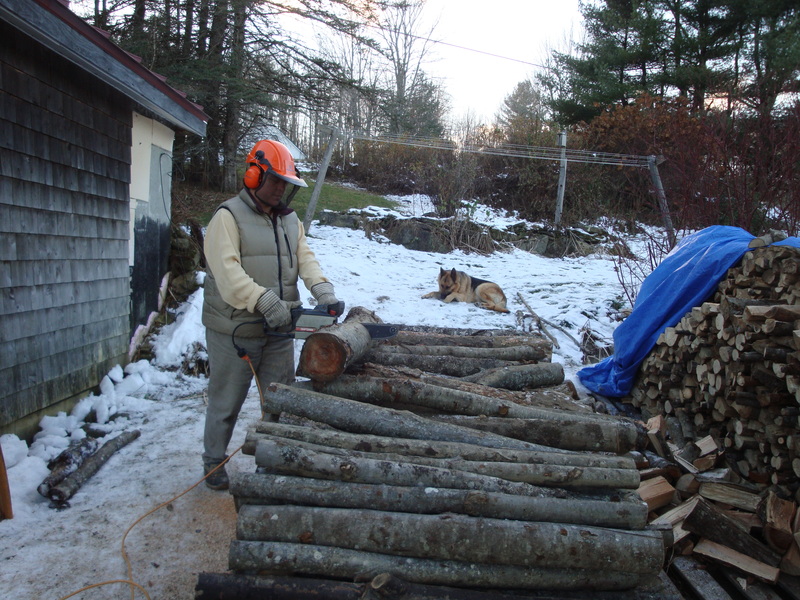 Here I am using an electric chainsaw to cut dry four foot lengths of firewood into stove length pieces. Then I will divide them up on our hydraulic log splitter into halves or quarters so they burn well. When I finish with this pile, we should have enough wood to go through the winter. Usually my husband would be taking care of this chore, using his gas powered chainsaws. But, he hurt his back three weeks ago and still is not able to do heavy work. We need to get the firewood put up, so I’m happy to do the job. This little electric saw is good practice for me. I’ve asked Santa for my own gas chainsaw. A new Stilh 170. It’s a small saw, nearly the lightest weight of the Stihl line. It will be perfect for me since I have an injured left rotator cuff and a heavy saw hurts me. I plan to prune the orchard into shape with my Christmas saw, then spread out over time to take care of all the little tree cutting chores that need to be done. Things that have been waiting because I hate to take my husband away from cutting firewood to do my little tasks. It’s hard to believe…yes, I’m excited about getting a chainsaw for Christmas! 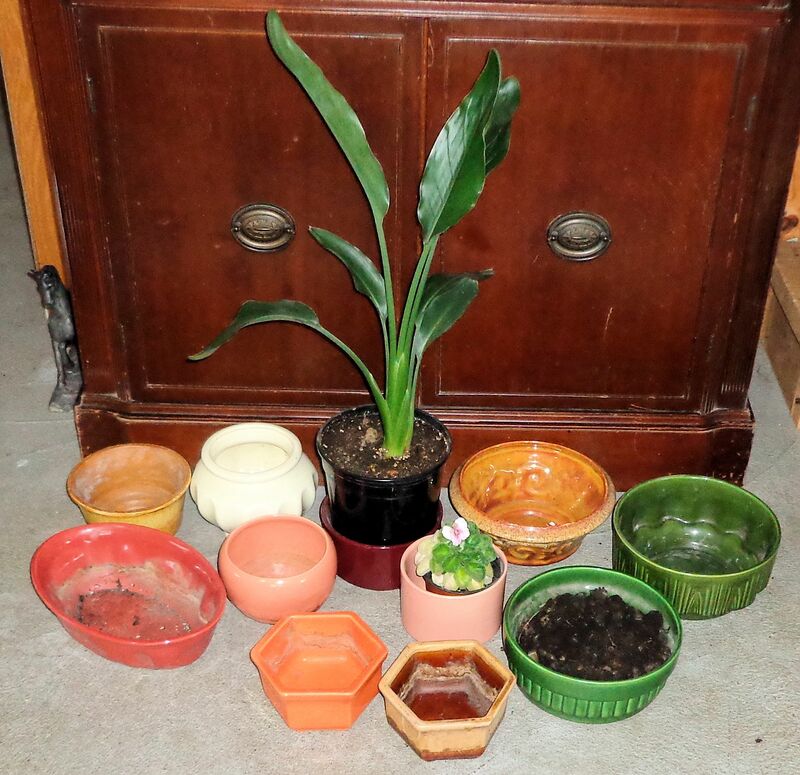 Although I am an inveterate pottery collector and can hardly pass a piece of nice fired clay without trying to take it home, Haeger pottery is my favorite and I collect it. The collection at my house is not huge, it doesn’t overwhelm the place. I mostly keep useful pots for my plants. Over the years I’ve acquired some of the amazing sculptural pieces the pottery has produced. 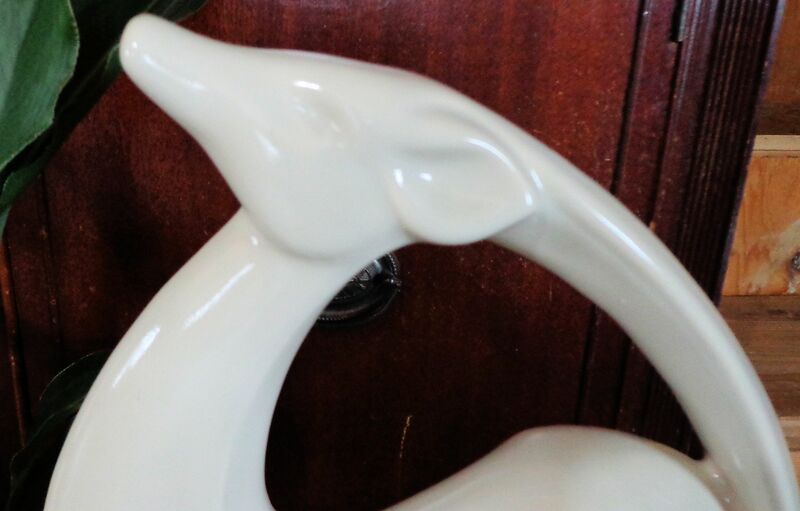 The excellent quality of the pottery, its substantial weight and fine crafting, along with beautiful art deco lines instilled in utilitarian pieces, and the use of lovely glazes are the main reasons I collect Haeger. 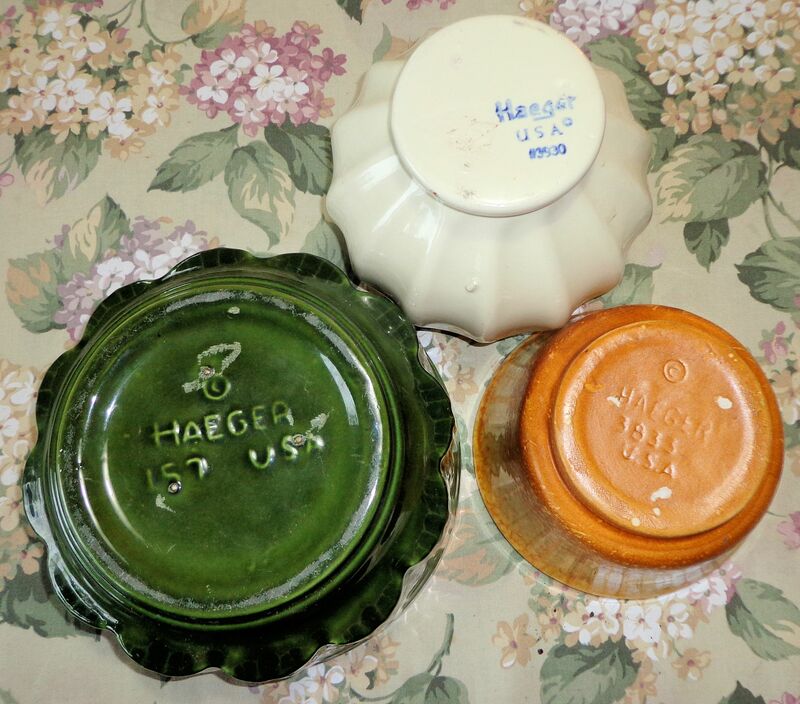 There is also a closer personal connection: my mother’s family name is Hager and they emigrated from Germany as did the founder of Haeger Pottery. The names are so close that I suspect there is some family connection deep in the German past. The Haeger Pottery began in 1871 when David Haeger purchased the Dundee brickyard on the banks of the Fox River in Dundee, IL, near Chicago. The great fire had destroyed much of Chicago that year and Haeger produced millions of bricks to help rebuild the city. 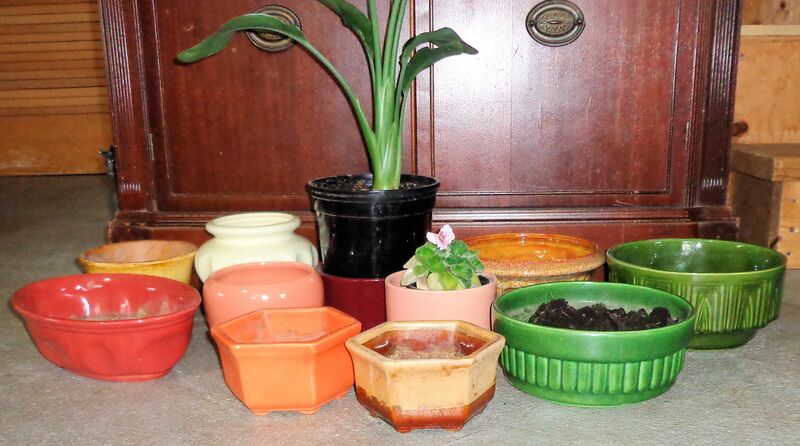 From bricks and tiles, the business expanded into flower pots. By 1912, artware was being produced. J. Martin Stangl joined Haeger in 1914, bringing strong artistic design to everyday pottery. In 1938, Royal Hickman came to work for Haeger. He was a design genius, introducing an art deco flair still popular today. He started the Royal Haeger line and designed the black panther and gazelle sculptures I own. 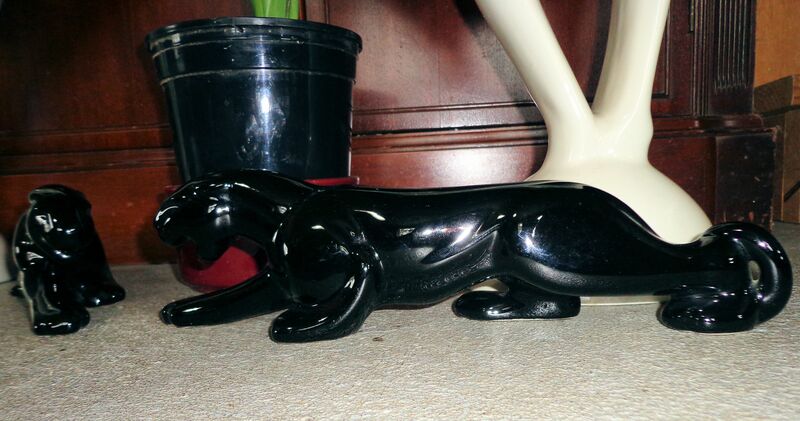 The panthers began production in 1941 and are still made today. 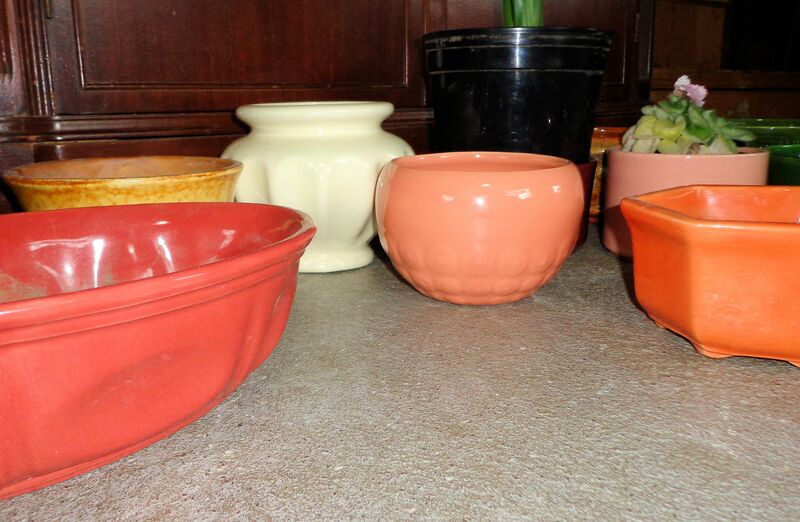 Haeger is an old, all- American pottery, using US supplied sand and clay for production. The company is run by a woman who started as president of the pottery in 1979. Alexandra Haeger Estes is the great-granddaughter of David Haeger. Haeger Pottery has flourished where many famous American pottery companies flagged and failed over the years due to Asian competition. Their work is available for purchase today and should be acquired to help support this long-lived company. My gazelles carry Haeger foil stickers, while the black panthers have lost their stickers. These are probably more modern pieces, likely produced in the 60s or 70s. The panthers are in perfect condition and measure 12.5″ long. 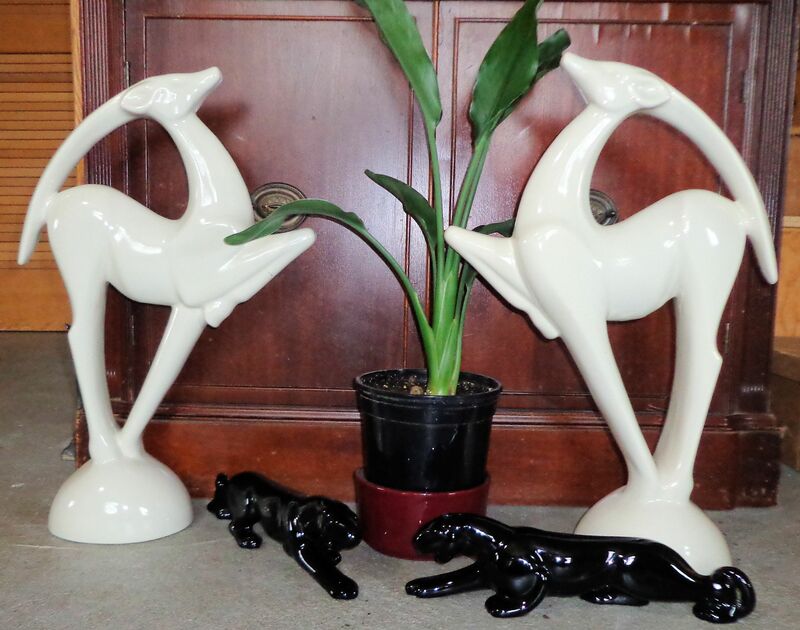 The gazelles, 20.5″ tall, were damaged when I purchased them at auction. Both have some hairline cracks. One gazelle has a chip on the nose. This same figurine was knocked over by a cat and had one knee broken. I glued it back together, but the piece has little resale value due to the damage. That’s fine with me since I bought them for the decorative beauty and they were affordable. These art deco Royal Haeger pieces can get a tad pricey. I appreciate the simple beauty of Haeger planters and never resist buying one when I find it. My favorite glaze is agate, a sort of drip effect on a solid base color. Unfortunately, I don’t own much agate glazed pottery…yet. A cat broke my best one. The cats are the biggest threat to my collection. The maker’s mark on Haeger pieces varies. The oldest production had a diamond-shaped mark and none of my collection carries this identification. The pots are mold embossed or incised or else backstamped with ink. Some Haeger will not be marked, like my panthers, due to the loss of foil labels. Still, Haeger is fairly easy to identify by the design quality, the solid feel of the item and the glaze. Every week I scout the second hand stores I visit for a new piece to join my collection. The monarch butterfly, Danaus plexippus, is a highly threatened species, nearing the brink of extinction. Hard to believe of a beloved insect that has brightened our yards and fields for generations. And before Europeans arrived in the Americas, monarch butterflies were here, in the millions and hundreds of millions. Today they are teetering on collapse. What has caused this disaster for the monarch butterfly? Many factors contribute, making the problem difficult to deal with. Part of the trouble is the specialized lifestyle of the insect and its dependence on a few plant species for survival. In the US, there are two monarch populations, one west of the Rocky Mountains and one east. The western butterflies winter on the California coast. The eastern ones winter in Mexico, on a particular tree, the oyamel. This fir tree occurs in the mountain cloud forest and is suspectible to climate change and lumbering. In summer, the Eastern monarchs migrate north and depend on milkweed (primarily the common Asclepias syriaca) for food. The larvae eat the leaves of only this particular plant. 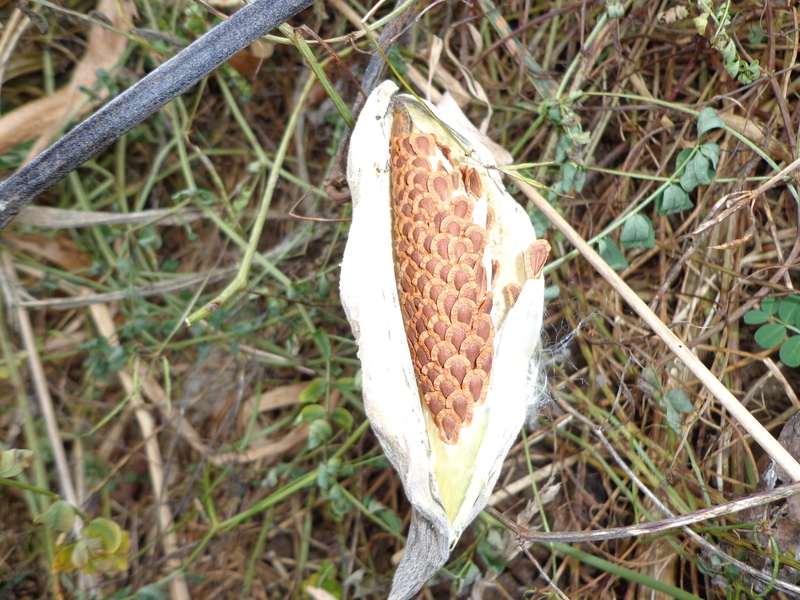 Milkweed range, especially in the Midwest, has been reduced by over 50%, mostly due to the emergence of genetically modified corn and soybean crops. These engineered crops are resistant to glyphosate, Roundup, herbicide. Milkweed is not. Where milkweed once flourished among the corn and soy, not to mention on what was once open, unfarmed land, now there is no milkweed. It has been eradicated by plowing for cropland and herbicide. A class of insecticides, neonicotinoids, also threaten pollinators such as bees and butterflies, yet the manufacturers agitate for its use on crops. The push to produce corn (bio-engineered corn that is easy to farm due to the use of herbicides) mainly for making bio-diesel, has greatly reduced the plant monarch butterflies need to survive. Hence, the monarchs are greatly reduced. Last year saw the lowest number of recorded monarchs returning to the Mexican wintering grounds. This alarming loss of a species spurred a request to the US Fish and Wildlife Service in August of this year to list the monarch butterfly as endangered. Such a listing would necessitate protective steps. Call me a cynic, but I fear this federal agency will bow to the overwhelming money of corporate giants like Monsato (producer of Roundup and genetically modified corn), and find that the butterflies are doing just fine. This agency has till late November to make a decision. I’m not holding my breath. America is lousy with powerful politicians who care little for the measly monarch butterfly but care a lot about money. I’ve introduced a new offering to my Etsy online store, aimed at helping the monarch in some small way. 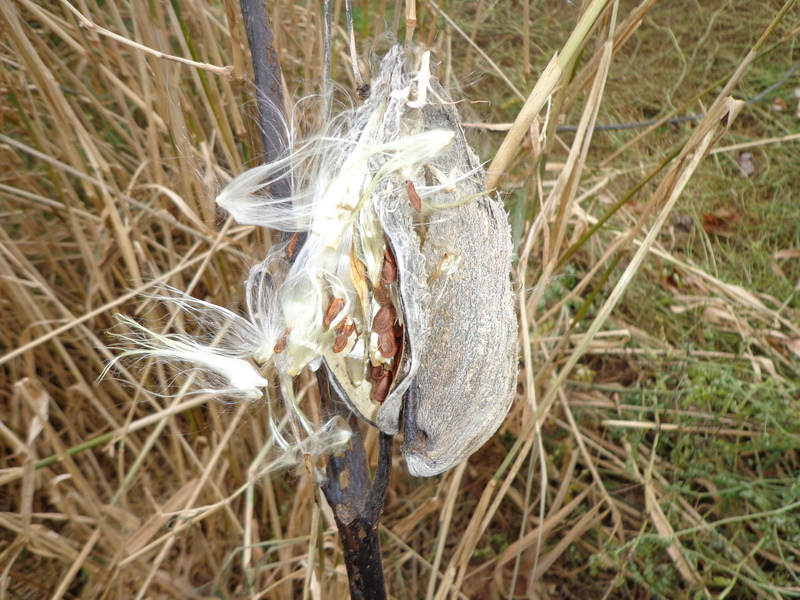 Here at Phoenix Farm, where things are done organically, we have a healthy supply of milkweed. This fall I sustainably harvested seeds from the wild plants growing along our fencelines and the edges of our fields and orchards. 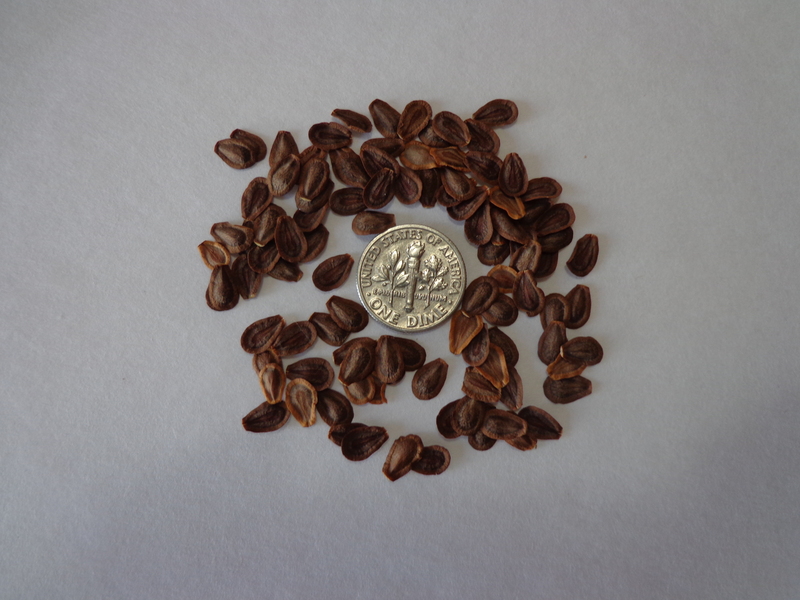 The seeds are for sale at a nominal fee to encourage milkweed planting. I am donating my time to gather and process these seeds for sale. To further help the monarchs, and the earth in general, I have decided to eliminate all genetically modified organisms–GMOs–from our diets and lives, as much as is humanly possible. Humans create the bio-engineered products thinking mostly about profit. The impact on the environment receives little attention. What starts as a great idea in the lab becomes a monster once unleashed on the world. I’ve decided to just say no to GMOs. Eating and buying organic, mainly certified organic, is the best way to guarantee GMOs are not included. Even then, minute traces of these inventions, what I think of as pollutants, are still present. They have invaded the environment and are difficult to remove…like most chemicals and pollutants humans have devised. Many voices decry the approaching food scarcity and point to it as an incentive for genetically modified organisms. These bio-engineered wonders will increase food production, experts wail, to fuel an ever-growing human population. I say we face not a food crisis, but an overpopulation crisis. Humans are over-running the world and pushing out all other species. The excessive numbers of our species is irresponsible. Such lack of foresight and failure to conserve resources seems innate human behavior. To continue enjoying a natural world containing creatures like the monarch butterfly, we must find a way to control ourselves. I hold out scant hope for the butterfly. The temporary barn is progressing nicely. 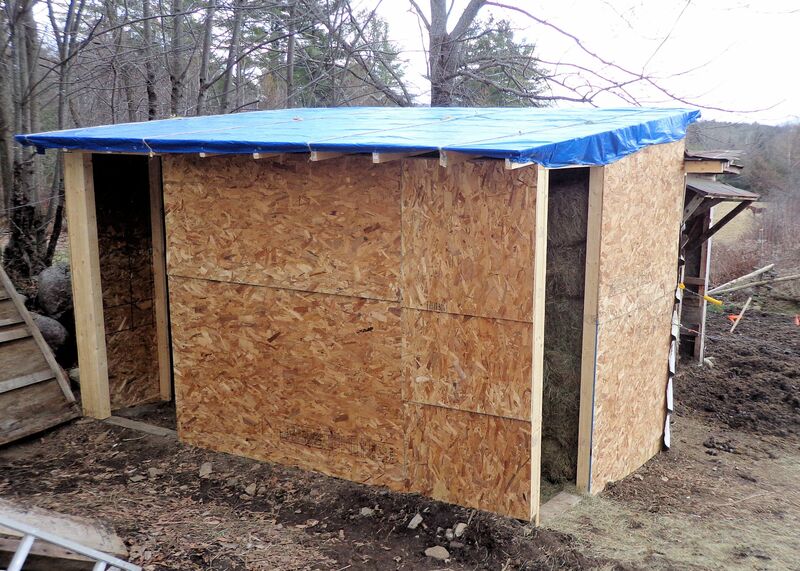 I framed in the hay storage area during the past week and worked until after dark last night putting the sheathing on the roof and covering the surface with a double layer of blue tarp. The hay building measures approximately 10 feet by 12 feet. Snow was forecast for overnight so I wanted to get the roof up and protected from the wet. We received 3″ of wet snow and the roof is working perfectly. I plan to search for affordable asphalt shingles for this roof and leave the tarps up in the meantime. The tarps are nailed along the sides and are held across the top with tie-down ropes. I am hoping this arrangement will last until I can secure four bundles of shingles to finish the roof. My neighbor gave me a bunch of shingles he had lying around. There were enough to cover two rooves of the temporary barn. He’s a great neighbor! I hope to find someone else with extra shingles who will sell them for less than the retail rate of $30 per bundle. 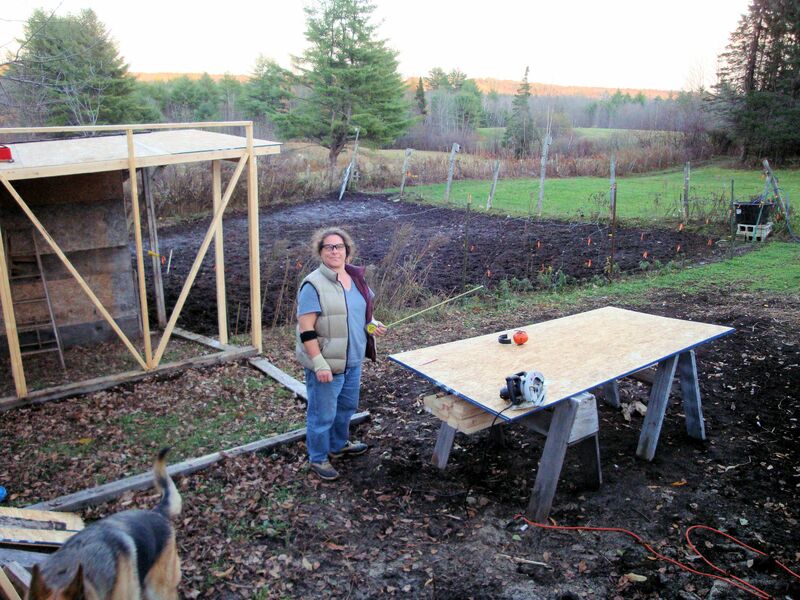 Now I will put up the siding, starting with the rabbit barn, the building uphill from the horses. 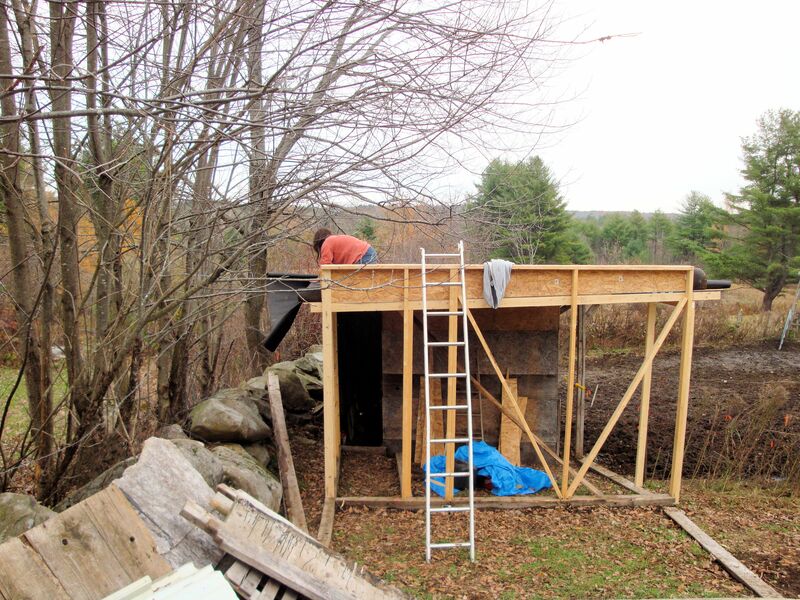 Once the barn is enclosed, it will be much warmer and more comfortable for the bunnies than the place where they currently live. Today I took off to rest my arms and shoulder (old rotator cuff injury,) since I worked extra hard yesterday to beat the weather. Tomorrow is supposed to be warmer, with melting snow, and I will be back to work on the barn. It took four days, but all the snow from the early, surprise storm has melted away. 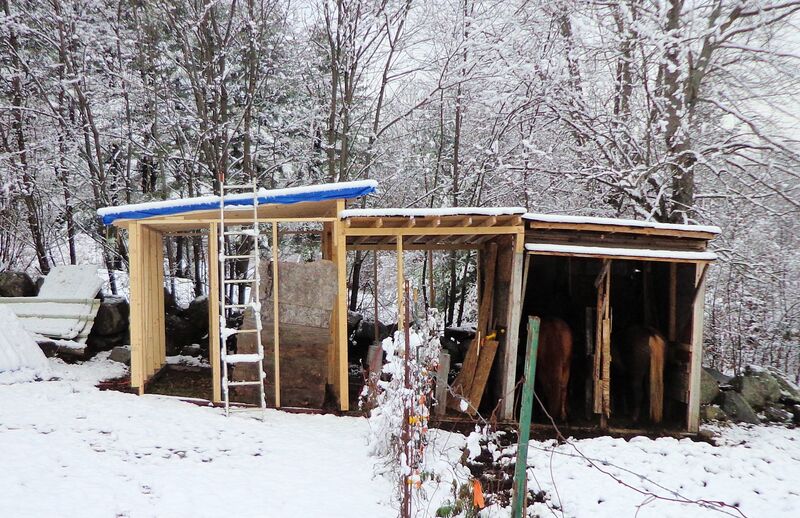 I’ve been busy constructing the temporary barn to house my animals this winter. 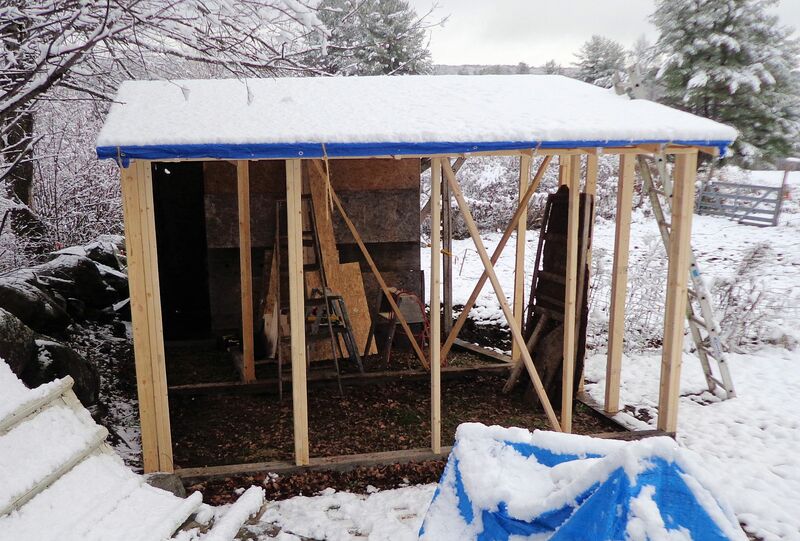 Once the new barn is up, I will demolish the area where my rabbits currently live before the heavy snows bring it down. The new part of the barn I’m working on will house my rabbits, I’ve decided. The roof is too low to be safe for horses. The lower ceiling will keep the rabbits warmer. 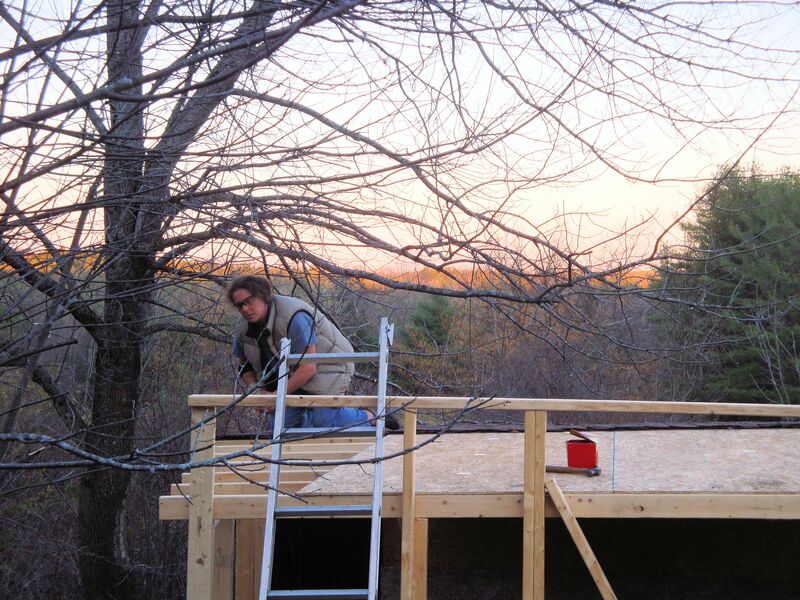 The new rabbit area is mostly framed and in these photos I’m working on the roof. Here I’m measuring for the last piece of particle board to finish the roof deck. Lifting the heavy panels to the top of the roof was hard for one person, but I did it. My husband, Tim, hurt his back and couldn’t help me. The next day, yesterday, I put on tar paper then asphalt shingles. The shingles were joined into the lower roof that covers the horse barn. We had a heavy rain last night and the roof didn’t leak, a major victory! Next, I will frame in the third new part of the temporary barn. This area will be large enough to hold a month’s supply of hay for the horses and bunnies and large metal garbage cans to keep their grain safe from rodents. The point of the roof of the third structure will attach at the top of the high wall in the photos. 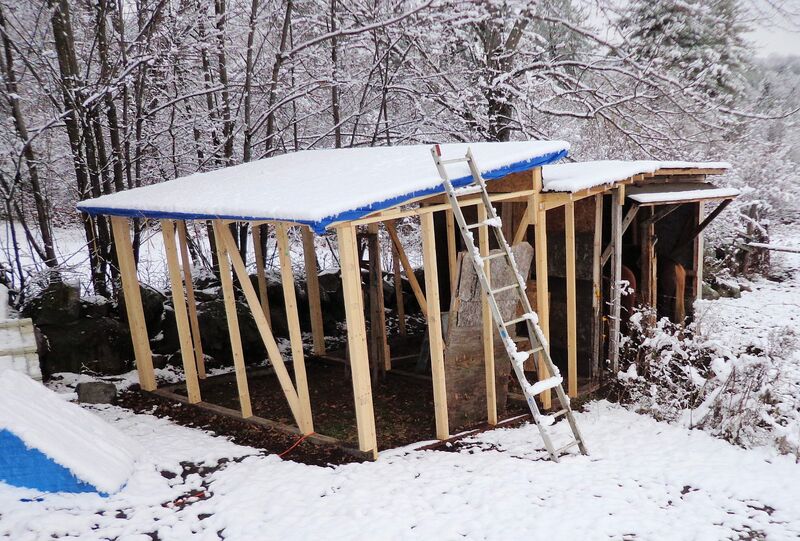 I hope to get this third structure up and roofed over before it snows for good. 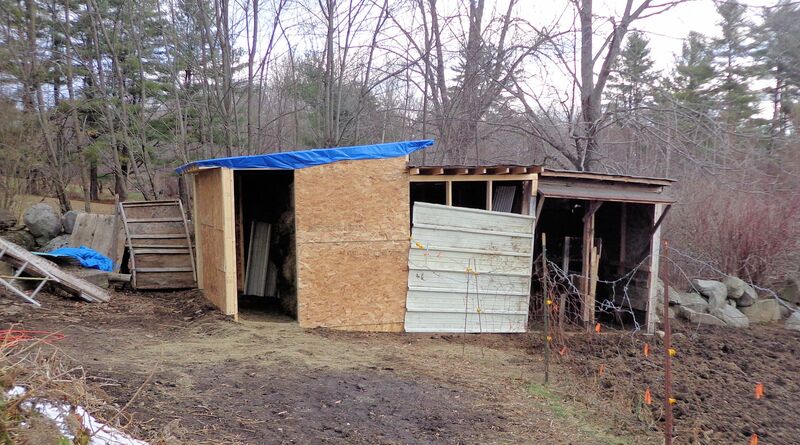 Once the roof is on, I can finish cutting the siding from under the shelter of the buildings.